Girls across the US have begun taking part in the boy scouts for the first time. 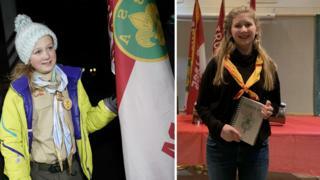 They are now able to work towards the Eagle award, the highest in US boy scouting, and the BBC has spoken to two who are beginning this journey. In May 2018, the Boy Scouts of America (BSA) announced it would change the name of its older scout programme to Scouts BSA and admit girls from February 2019, in a drive to be more inclusive. Girls will not be mixed with the boys, but will be able to earn the same merit badges and achieve the same ranks. I’m not exactly sure how this came about. I mean, “girls in the Boy Scouts? It’s a slap in the face of traditional scouting, no matter what your point of view is, girls simply don’t belong in the Boy Scouts. There’s a relatively simple rationale to this, and it doesn’t take a rocket scientist to figure it out. The article states that “Girls will not be mixed with boys” however I think this move may set a precedence for that very thing at some point in the future. Nothing against girls, girls are great! but is it not fair to say girls should and do have their own program? I was a Boy Scout and a Eagle, I don’t remember any girls in any of my Troops nor should I have as it was a time for young boys learning traditional boy stuff in preparation for manhood. Girl Scouts also had this in mind for the girls of America. So what gives? what is it behind all this radical changing of two great decades old clubs and traditions.? I think there are many theories out there and some are more believable than others. One might argue that it’s simply a participation problem, that there has been a large decline in interest by boys to take part in scouting. If that’s the case, allowing girls in would mean more revenue flowing into the BSA to offset the lack of participation by boys. Another might argue it’s because of recent changes made in the BSA where gays and transgenders are now allowed as leaders and scouts. This one I’m certain has played a roll in how some parents feel about the scouts and whether you like it or not, it will continue to as they wont allow their kids to be led, or associate with these social groups. “The times they are a changing” as some folks would say, and could it be that there is a push from women as there is now in all other aspects of business and other arenas, to be at the top, to dominate as so many are being led to believe that that’s what they need to do because well, men are evil. Who knows what the real reason for it is, or maybe there’s more than one reason. I certainly don’t believe for a minute that it’s simply because they want the same merit badges as the Boys get, after all, the Girl Scouts have their own. The whole pretense as it has been presented, is that they want to be Eagle Scouts. I ask why do they want to achieve a level of scouting created for boys? Is it simply a competition thing? if so, why? girls are cool, they had their own thing, so what’s the real reason this is going on?